We know doing more with less is your mandate. And an in-house IT staff can be costly, not to mention leaving you without critical expertise in the latest technologies. Let Content Creations Managed Services free you and your staff up for the business of running the business. Get on-demand talent, depth of experience, ample resources and huge economies of scale at a lower cost compared to doing it in-house. Annual Planning & Budgeting – business and IT strategy alignment to drive the value you paid for out of your IT environment. Quarterly Reviews & Reports – check in with executive management to report on and review the status of initiatives, budgets and IT improvement metrics and goals. Ad-hoc Advisory Services – participating in company meetings and activities where we can add value. 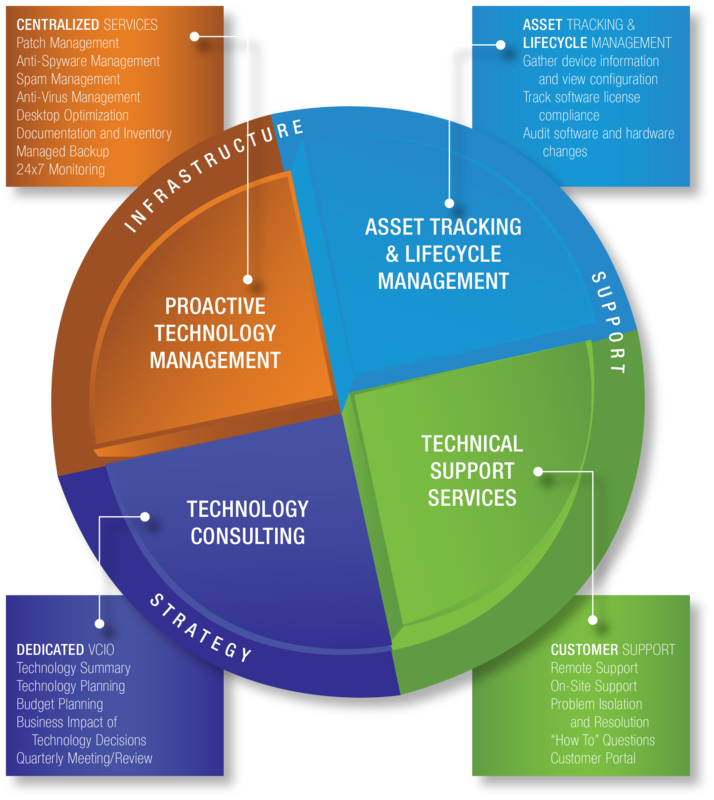 Our vCIO services are most effective when integrated seamlessly with your business management. We ensure the health of your infrastructure, so you don’t have to. IT problems can creep up on you. When they do, they’ll be inconvenient—and often expensive. Sleep better at night knowing your infrastructure is under round-the-clock watch of our experts. You get Administration, 24x7x365 Monitoring and Maintenance that provides comprehensive server and desktop management to proactively update, back up and manage all of your computers and servers remotely. Every aspect of the network is monitored so issues can be detected before causing a problem. When hardware fails, the labor to do the repair is included. Content Creations IT Managed Services are affordable, flat fee-based managed services solutions that enable organizations to maximize the performance of their IT infrastructure. With options for 24/7/365 monitoring, automated performance tuning and maintenance, IT help desk, remote and onsite computer support, we keep your focus where it should be—on your business. Let Content Creations customize a Managed Services Plan for your business.